John Barr’s Meat Whistle is one of the most popular streamers in the west. It is an excellent baitfish imitation, having a simplistic design without the unnecessary bulk of modern-day streamers. The tungsten conehead allows it to sink quickly, while the marabou collar, rabbit zonker, and Sili legs create great action in the water. Tied for long lasting durability and performance the Meat Whistle is a must-have in your streamer arsenal! 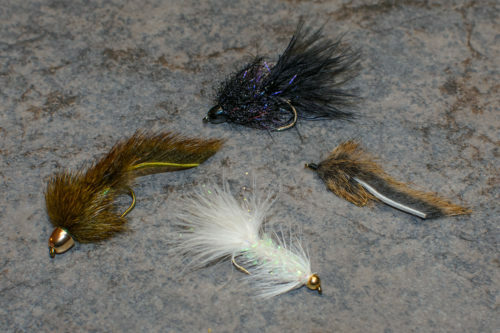 John Barr has created some of our favorite streamers at Tailwater Junkie; the Slumpbuster and the Meat Whistle. You cannot go wrong with either! Our favorite colors to fish are black, olive and white. Minnows and baitfish provide trout with more bang for their buck and they rarely refuse the opportunity to eat one. In most cases, we strip a Meat Whistle with a traditional down and across delivery. We have found that a slower, shorter retrieve provides the best results. But, don’t be afraid to think outside the box from time to time and mix things up with a slower retrieve or a dead-drift presentation. Whether you are swinging it, stripping it, or dead-drifting it in smaller sizes the Meat Whistle is a must-have and deserves a spot in any angler’s fly box. This fly is equally effective on rivers and stillwater.